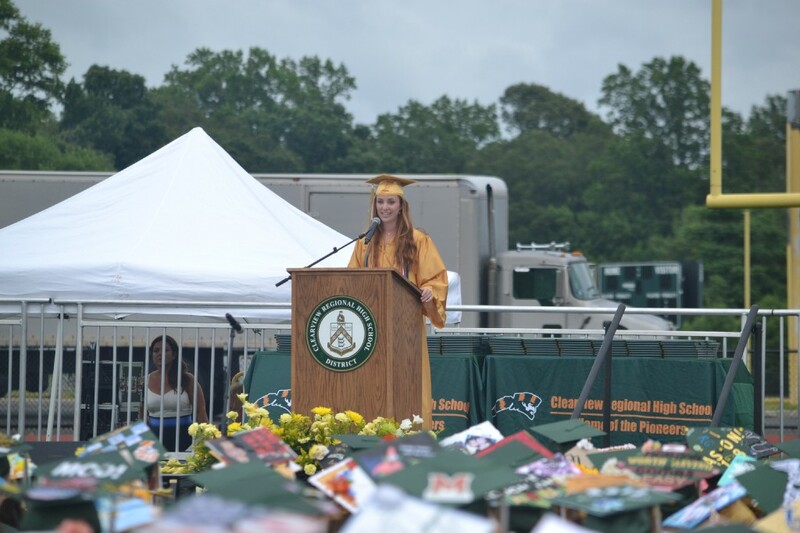 Julia Rothstein addressing her class at graduation. The top two Pioneers in the Clearview Regional High School class of 2018 have a couple things in common — consistency in grades and a love for math and science. Shawn TuCai, valedictorian, and Julia Rothstein, salutatorian, won’t be traveling too far from home to attend college; however, that doesn’t mean their schools of choice were easy to get into. Excited for a new start, TuCai will study biological sciences at Rutgers-New Brunswick while Rothstein picked math as her major at the University of Delaware. Both students are accepted into their respective schools’ honors programs due to their success at Clearview over the past four years. Both students knew early in their high school careers that their graders were above average. Despite knowing this, neither let decimal points dictate their habits. Imagining standing in front of juniors, sophomores and freshmen, Rothstein said she would urge her fellow Pioneers to stay in the moment, rather than worry about grade point average. “Don’t worry about every grade you get on every paper and don’t worry about class rank all of the time because it is not going to help you succeed. Just make sure you are getting the most out of every class you take and success will come,” she said. The valedictorian stressed the consequences of not taking schooling seriously, no matter the subject. “In higher-level classes, if you miss a day, you are doing make-up work for a week. Getting notes is not the same, it is better to just be there. Attendance was a main factor in my success,” he said, adding that “being prepared” is key and he will carry this mindset to New Brunswick. While both students feel many of their teachers made lasting impressions on them, they both spoke fondly and at length about math teacher Karl Neiswender. “His class (AP calculus) is probably the best class I had all together. He has taught me more about that one subject than anything else, and I’ve always had a love for math,” Rothstein said, adding AP calculus was one of the most difficult classes she has ever taken. TuCai noted Neiswender’s dedication to students and passion for math were inspiring to him, especially as he takes the leap into college where he will face more intense classes. Both students feel Neiwender’s classes have helped prepare them for what is to come. However, there is little that prepares a person to say goodbye. “When I was an underclassman, I didn’t think I’d be emotional before graduation. Senior year has been quite a ride,” TuCai said. The valedictorian said he will miss his friends the most and knows that once he leaves Clearview all of their lives will change. Both students were heavily involved in all aspects of high school life while at Clearview. TuCai played soccer and enjoyed being part of math and science leagues and also the technology student association. Rothstein was part of the Latin Club, Red Cross Club and more. She was also a three-sport athlete and part of this year’s lacrosse team that won the South Jersey Group IV championship.